Gold farming, game labour, playbor – these terms are used to refer to the harvesting of online game items, currencies, and characters with a view to selling them to earn income. As part of a new research project on online work, my colleagues Mark Graham, Isis Hjorth, Helena Barnard, and myself are conducting new research on this intriguing shadow industry. This post summarizes some initial findings, particularly pertaining to the international divisions of labour in the industry. Screenshot from ArcheAge, a massively-multiplayer online game by Korean developer XL Games. 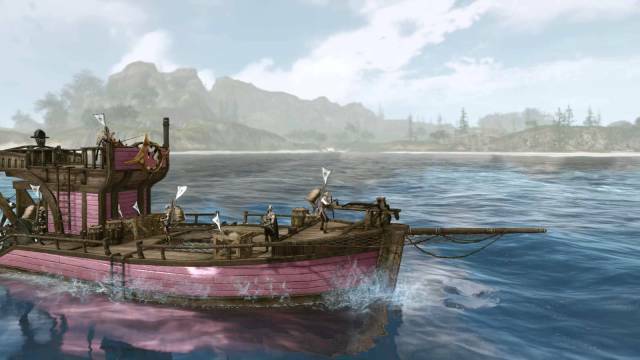 Virtual goods in ArcheAge are among the most traded on PlayerAuctions today. We know from earlier research that the “third-party gaming services industry” is geographically segmented by function: much if not most production takes place in China, while customer-facing functions are performed especially in the Philippines. This is despite the fact that this is a highly “virtual” industry, in the sense that all of the products and production processes are based on information and communication technologies, and could in principle be carried out from any place that has suitable connectivity. Our new initial findings suggest that production in this industry is further geographically segmented by product category: China dominates in game currency and game item production, but most game characters (accounts) are produced elsewhere. Moreover, the findings help explain why we see these particular geographies in the industry. Besides shedding light on the gaming services industry itself, these findings contribute to our understanding of the geographic structuring of “virtual” industries and forms of online work more generally. I have previously published findings and analysis on the third-party gaming services industry in a World Bank report and my recent book. In this new project, my colleagues and I collaborate with a marketplace called PlayerAuctions to obtain market data, and conduct interviews with managers and workers in the industry. As I write this initial summary, we are just finishing fieldwork in the Philippines. Next we will focus on other countries, and continue data collection for several months more. But as promised, here are some initial thoughts and findings. Earlier research has noted that the third-party gaming services industry has largely moved from its initial locations in rich Western countries to various low- and middle-income Asian countries. Our initial findings support this claim. Figure 1 shows the top supplier countries in PlayerAuctions in January this year. 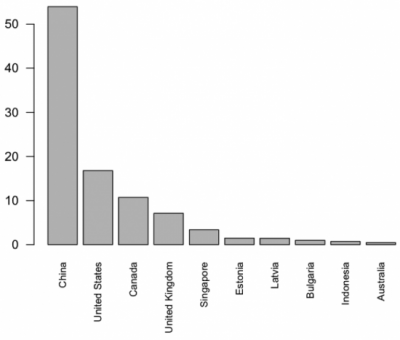 China dominates, with United States on the distant second place. The overall shift to Asia is easy to explain through increasing Internet connectivity and cheaper labour costs in Asia. But why did production move specifically to China, rather than, for example, the Philippines? And why did production and customer-facing functions move to two different places in Asia (China and Philippines)? Furthermore, does this mean that as Internet connectivity improves in other regions, such as Sub-Saharan Africa, some or all parts of the gaming services value chain could move there next? I will address these questions in turn. Earlier research has identified some possible explanations why production moved specifically to China. Producing game assets naturally requires gaming skills. China has a long tradition of online gaming of the sort implicated in the gaming services industry, while India doesn’t. This would explain why production moved to China rather than India. But Philippines also has online gamers – why didn’t production move there? A manager whom we interviewed in the Philippines suggested that the reason might simply be the cost of electricity. Relative to many other “virtual” industries, gaming services are particularly power-hungry, as games require powerful CPUs and graphics chips. In many parts of China, one can buy reliable electricity at low, state-subsidized prices, whereas in the Philippines, electricity can be many times more expensive, reliable electricity even more so. The cost and reliability of electricity production and delivery in Philippines may be exacerbated by the fact that the the country is an archipelago of 7,107 islands. This simple material factor may have shaped the global geography of gaming services production. However, our analyses suggest that the geography of game asset production is actually more complex than previous research and Figure 1 suggest. Although China dominates the overall production of third-party gaming services, a country breakdown by product/service category reveals that China is much stronger in some product categories than in others. Besides game currencies, items, and characters (accounts), the industry also provides “powerleveling” and “boosting” services: that is, hiring someone to play your character, or to play alongside you, in order to advance in the game faster. Table 1 shows that China dominates currency and item production in PlayerAuctions, but produces only about half of powerleveling services, and only a small fraction of game accounts. Most accounts by far are produced in the United States, and 41 percent of powerleveling services by value are also produced there. Given the higher U.S. labour cost, much of the U.S. supply may come from hobbyist gamers engaging in it as a side activity rather than from full-time game labourers. Why do the geographies of production differ so much between product categories? Our findings suggest two possible explanations. First, accounts and powerleveling are more service- than product-like. They are highly differentiated and customized for the buyer, in contrast to currencies and items, which are pure commodities. The production and delivery of accounts and powerleveling necessarily involves communication and interaction between the buyer and the producer (for example, dealing with account security questions). Most Chinese producers lack the language skills and cultural fluency to successfully communicate with buyers from North America, Europe, and Australia, and are thus disadvantaged in account sales. This does not prevent them from successfully dealing in the virtual commodity markets, where communications can be limited to a few standard phrases. Second, account and powerleveling services involve a higher risk of intervention from game publishers than virtual commodity sales. When control over an account changes hands, the publisher can see the player’s IP address changing, whereas with commodities, no such IP address change happens. Our informants believed that Chinese producers might incur a higher risk of detection than Western producers. Chinese producers might also ill afford the financial impact of a lost account, in contrast to better-capitalized Western producers. Due to lack of access to Western legal identities and payment systems, it would also be more difficult for Chinese producers to acquire fresh accounts, the raw material of account production. Differences in the geographies of production in different product categories could thus be explained by differences in communication ability, cultural fluency, and access to legal and payment systems. We examined similar questions in the first conference paper to issue from this project, titled “Online labour markets – leveling the playing field for international service markets?”. In this paper, we examined geographic patterns in online labour trade on oDesk. Following institutional approaches in studies of international trade and development, we theorized communication ability and cultural fluency as “embeddedness in informal institutions”. We likewise theorized access to legal systems as “embeddedness in formal institutions”. Payment systems also fall under formal institutions. Our conclusion was that although the Internet can eliminate physical distance, it cannot do as much to reduce the institutional distances between trade partners. As a consequence, geography will continue to structure even purely “virtual” industries. 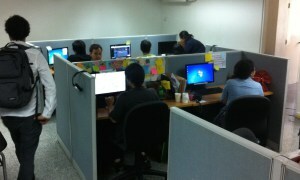 Customer support staff of a virtual goods marketplace in Manila, Philippines. Consider the customer-facing functions of the third-party gaming services industry. These functions consist of marketing, customer support, and risk management. The latter refers to, for example, preventing credit card chargeback fraud. While production moved in large part to China, these parts of the value chain moved instead to the Philippines. China’s formal institutions, including the legal and banking systems, are relatively unique to that country. Philippines, on the other hand, has more Western-style formal institutions, so much so that one informant’s previous work experience as a Filipino loan agent now helps him lead global risk management at PlayerAuctions. Filipinos also tend to be more embedded in America’s informal institutions, more so than some other relatively skilled English-speakers, like Indians. Many Filipinos buy the same grocery brands, eat in the same fast food chains, and watch many of the same television series as Americans. This probably makes them more fluent in dealing with American customers and understanding their preferences. What prospects, then, do newly connected regions like Sub-Saharan Africa have for capturing a slice of the third-party gaming services market? The least we can say is that connectivity alone does not predict much: infrastructure, skills, and the compatibility of formal and informal institutions will play crucial parts. One interesting aspect of this market in this regard is that there is significant domestic demand for gaming services in China’s rich cities. Currently this demand is being served by domestic Chinese producers. But China is in the process of strengthening both formal and informal linkages with many of Africa’s newly-connected countries.Our interviewees believed that the global third-party gaming services market is still growing. Perhaps we will see Sub-Saharan virtual gold farmers yet. Note: This post was originally published on the OII's Connectivity, Inclusion, Inequality blog on 29 October 2014 2:03 pm . It might have been updated since then in its original location. The post gives the views of the author(s), and not necessarily the position of the Oxford Internet Institute.